Are we able to find Hidden Champions in the Age of the Internet? The Age of the Internet has seen many Internet companies emerging in the 21st Century, and the most profitable Internet company in China is none other than Alibaba. Alibaba Group was founded by Jack Ma along with 17 other co-founders in 1999 with the website Alibaba.com, a business-to-business portal with an aim to connect Chinese manufacturers with international buyers. Today, Alibaba Group Holding Limited is one of the biggest companies in China that provides consumer-to-consumer (Taobao.com), business-to-consumer (TMall.com) and business-to-business (Alibaba.com) sales and various other services via e-commerce web as well as offline portals. The company accounts for 75% of all online retail sales in China. As of 2018 the company has 550 million active users, larger than the entire population of the United States. The market capital has doubled since its listing on 19 Sep 2014. At first glance, the idea of Alibaba being a “Hidden Champion” seems incredible, with the Hidden Champions characteristics seemingly the polar opposite of what the specific group of companies that are regarded as a central pillar of the German economy (Alibaba, low-profile? Really?). Digging deeper, however, we are able to compare and see how Alibaba, like many hidden-champions-esque companies, are market leaders in their respective markets and achieve success in an ever-changing business environment. As far as Alibaba’s business model is concerned, there are no disruptive new innovations; however, they are closer to the market, closer to the consumer, and faster in action as compared to their competitors. True to the saying, “百舸争流千帆竞，借海扬帆奋者先。”,or “hundreds of companies are competing in the industry, but when one is hardworking, coupled with the tailwind of the “trend” of the industry, one can go the distance and be the number one”. The business model of Alibaba is different from direct competitors like Amazon, as they prefer to focus on being a platform to assist others to run successful e-commerce businesses, instead of running it themselves. This is highlighted in their website, where Alibaba’s group mission is to make it easy for anyone to do business anywhere. Of course, the company will need funds for the company to realise its mission. So how exactly does Alibaba make its money? Over here, I would like to share with you “a clue” to look into such a complex company such as Alibaba. Firstly, let’s find out where is the real source of money from. (2) Cloud Computing is the new business sector (5.4% of sales), supporting Ali’s web operations, and besides that, its storage computing systems will contribute to the future growth of Alibaba’s entire ecosystem. (3) Digital Media & Entertainment (7.8% of sales), helps to strengthen the promotion on the e-commerce platform. (4) Innovation Initiatives & Others (1.3% of sales), includes mobile apps like Gaode Map etc. (5) Other investment such as Ant Finance is not under Alibaba Group’s business, but Alibaba will own 33% of Ant Finance, and 50% of Koubei. *As of 26 Sep 2017, Alibaba increase share in Cainiao Network to 51%, the result of Cainiao Network will be consolidated to Alibaba’s result after mid Oct 2017. With these three main business pillars, Alibaba created an ecosystem where they do not need to spend capital on purchasing, logistics, it minimises the manpower and material resources to support each other. 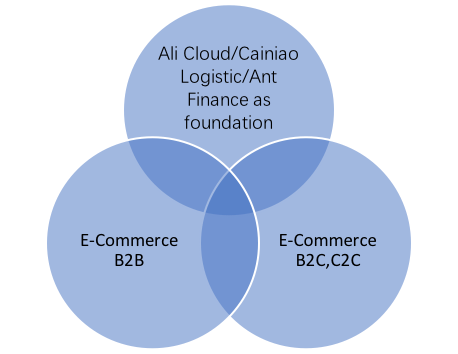 Among the three business pillars, E-commerce is the biggest contributor to Alibaba’s revenue. 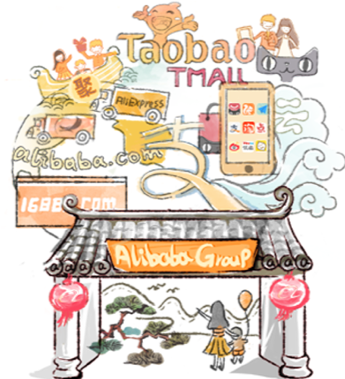 Taobao’s profit is mainly derived on various forms of advertising, while Tmall receives rent directly from the seller, as the seller pays a certain percentage of the commission for every successful order through Alipay. However, Tmall sellers are able to purchase advertisements to attract more traffic to their “store”. This way, Taobao and Tmall online advertising fees was able to account for 50% of the total revenue, and Tmall’s commission fees accounted for 22% of the total revenue. Why does Alibaba appear so attractive to advertisers? Instead of selling “advertisements”, perhaps one can say that Alibaba is selling “data”. For any advertisers advertising on web portal, WeChat public account or Baidu, they may need to brainstorm on the methods or ideas to target the desired group. However, on Taobao or Tmall, what one just need to do is promote an “event” poster or a “shop entrance” on the homepage, and interested customers will start streaming in. In the course of its operations, Alibaba is able to leverage on the large amount of transaction data of its customers collected from its payment platform (Alipay), and help its merchants to market their brands effectively. This “Big Data” is the key to the win-win situation among Alibaba, advertisers, merchants and consumers, and such “precise advertisements” have become the biggest competitive advantage of Alibaba among its competitors. At the same time, understanding the main sourse of revenue for Alibaba will help us have better understanding of the feasibility of their future expansion strategy. Secondly, with this understanding, let us have a look on how Alibaba is able deliver the advertisements accurately. 1.Alibaba has been working hard to weave a super ecological network to enlarge its data base, pushing accurate advertisements to consumers through trend analysis with enough data base. For example, there are many complex roles within Taobao. Sellers, buyers, and various service providers such as credit system (Ant Finance), Logistics service (Cainiao Network), Payment service (Ant Finance), Cloud computing (Ali-Cloud) etc. 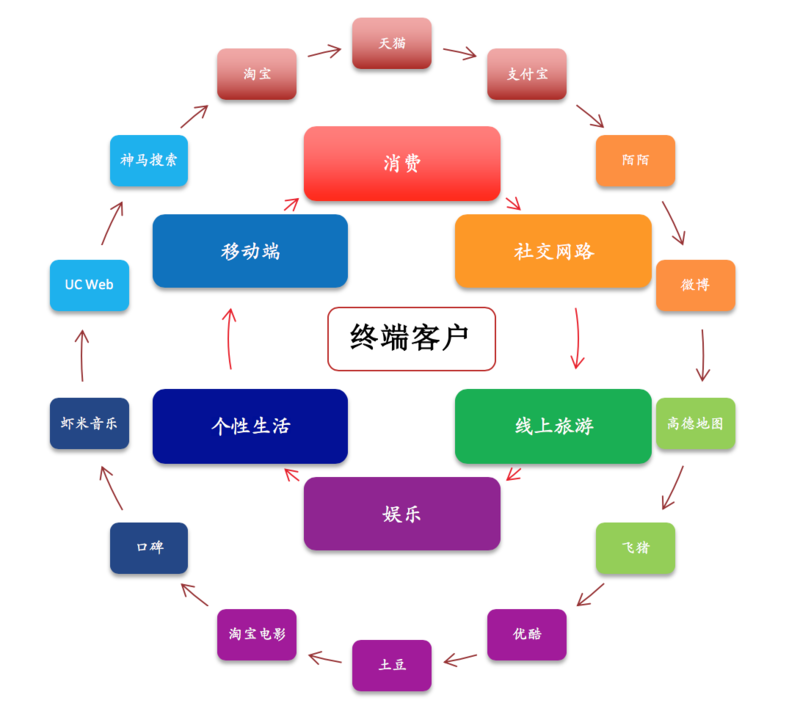 are multiple roles that has complex interactions between each other, and this forms a very complex yet synergized network, driving the rapid expansion of the Alibaba ecosystem. 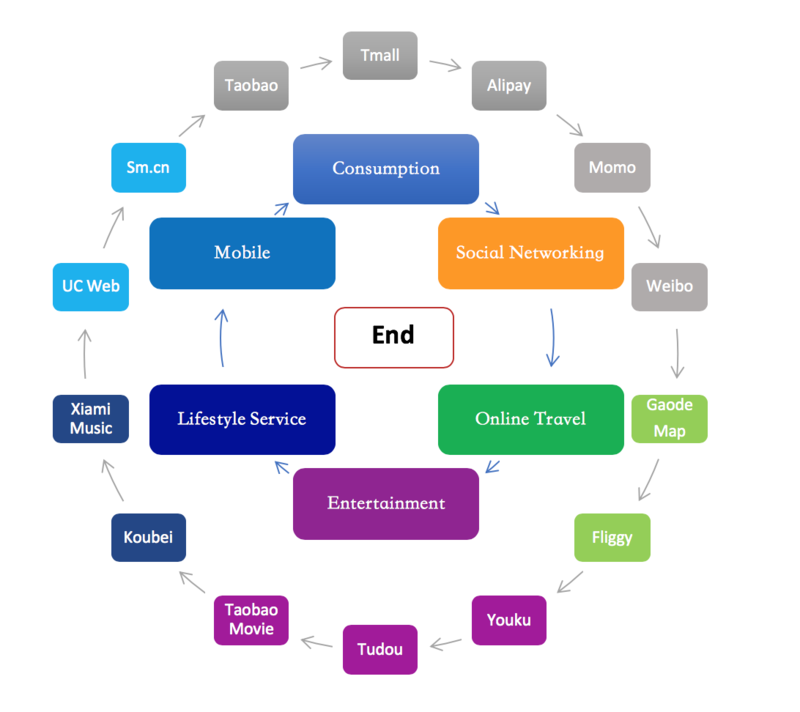 The Alibaba ecosystem is massive currently, comprising the company’s core e-commerce platforms (Tmall, Taobao, Ali Express and more), digital media and entertainment divisions (Youku, Alibaba music,Weibo etc), local services such as Koubei etc, with over 550mil active buyers at Alibaba’s platform, and it is all thanks to Alibaba focus on consumer’s demand. According to Amazon’s CEO Jeff Bezos in his book <<The Everything Store>>, the essence of the retail industry can be summarized to: In order to meet the changing needs of consumers, the supply chain efficiency must be constantly improving. With Alibaba which is centred in Asia, and Amazon on the other side of the ocean, both of them are able to expand their business focusing on this unchanging core within these 2 decades. In this era of the Internet, those who has buyers traffic, has the advantage over others. “Uni-Marketing”, a suite of tools launched in June 2017, gathers and analyses cross-platform data based on the unified IDs, enabling brands to better target customers over the product lifecycle and promoting their brands effectively. Users can use their unified ID to login into different platforms, and Alibaba is able to fully understand their interest and demand. From consumption, social networking, online travel, entertainment, lifestyle service, and mobile, you can find Alibaba in every field. This is such a complex cooperative network, but yet it creates such a huge synergy, which allows Alibaba to contribute enormous value to the society. At the same time, the development of such a complex network has further promoted the development of a global collaborative network like Alipay (Ant Finance) and Cainiao Network, leading them to a broader social synergy in the future. 1.2 Based in China and Go Global – The “Five New” Strategy. In order to grow the business, Alibaba’s forward-looking leader Jack Ma revealed a “five new” strategy at the Hangzhou Yunqi Conference in 2016. (“Five New” refers to the new retail, new manufacturing, new finance, new technologies, new resources.) In the Chairman statement in the 2016 annual report, it highlighted that data will become a new resource and computing will be a new technology, and these coupled with logistics support will trigger the evolvement of new retail, new manufacturing and new finance. What this essentially means is that e-commerce will eventually move towards a “new retail” model, with online and offline combining with logistics. The aim for them will no longer be “who is able to provide the faster service”, and instead to “allow enterprises to be inventory free”. The future in manufacturing will allow businesses to completely move from B2C to C2B by customizing goods based on demand, with the focus on intelligence, personalization and customization. 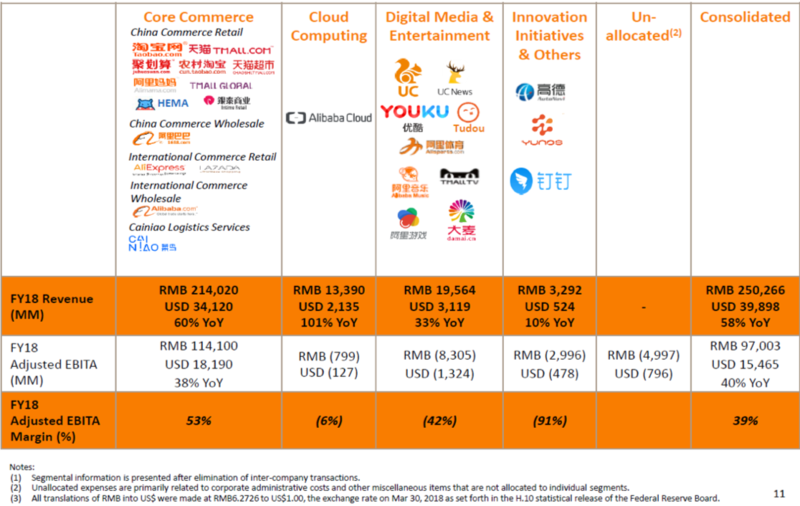 Reviewing the investments done by Alibaba in FY 2018 (refer to Figure 3: Alibaba’s new retail layout), the new retail-driven business transformation and continued large-scale technology investments occupied the most important position, aiming to create a new long-term high growth future. China: The New Retail strategy aims to increase overall sales (more network transactions, store transactions, and advertising fees) through New Retail strategy. The last mile delivery reaching 200 million people: Connect directly with consumers, reaching the 30% of online users who have not purchased anything online yet; Expanding into areas the original online mall is unable to reach, such as fresh fruits and vegetables. The physical store interacts with consumers and provides fast deliveries to customers, increasing the user experience thus increasing the chances of repurchases. Go global: Through technology (Ali-Cloud, Ant Finance), Alibaba’s journey to the world can be accelerated to achieve globalization and create a larger ecological network. Alibaba’s network is so large yet they are able to remain close to each other mainly because of the “BIG DATA” that creates a win-win among the ecosystem. Backed by Ali’s big data, new retail will be infinitely closer to the consumers’ needs, have different retail formats, a more diverse variety of products, and in the near future consumers will no longer be restricted by where they are. The more people use technology, the more valuable it becomes. Just like how the Internet has changed our way of life, Taobao has changed the way the Chinese shop, Alipay has revolutionised the methods of payments for the Chinese, YuEBao has changed the way the Chinese manage their finances. Among these, Alibaba has always focussed on the consumers’ experience, and despite their size, they are true to their original mission: to assist small and medium-sized entrepreneurs. Through continuous investment, whether it is technology or start-ups, Alibaba strives to lead the market and take the lead in laying out the framework. When other businesses strives and discovers opportunities, Alibaba would have laid the “framework”, and when it grows big enough, there will be no business that is “hard to do” in the world. Focus on serving consumers – the only thing that does not change in the world is the changing needs of consumers. Focusing on the core of business (advertising), Alibaba is continuously collecting more data to achieve more accurate advertising. Constantly investing in the future – going through the technology output to the world, continuously expanding the ecosystem, relying on Ali’s Big Data to connect the networks to each other. What is written above are some key inspirations and ideas that I have gathered personally from Alibaba, and is not a suggestion nor recommendation for any investment advice. Being able to share these ideas also helps me to reflect and think about where to start if I’m analysing giant company like Alibaba. Are we able to identify the common pattern, be it how the company operates or their future expansion plan, and use these and seek out early-stage tech hidden champions? Has the industrial revolution driven by the Internet and e-commerce has quietly promoted the transformation of the hidden champion enterprises into brands and intelligence? In recent years, has “focussed & specialised” concept commonly found in hidden champions expanded from the traditional manufacturing industry to the modern service industry and the emerging Internet industry? If so, this would mean that there are more hidden champions are around us. Have you found any?